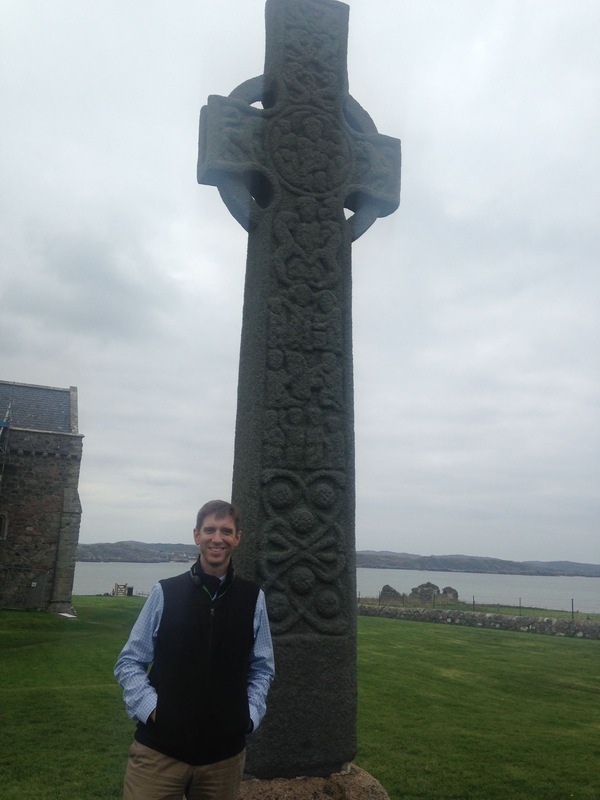 St. Martin’s Cross has stood in its original location for 1200 years, dating back to about 800 A.D. The cross greets worshipers and pilgrims approaching the Abbey (just over my right shoulder). On this side, biblical scenes are depicted; the opposite side is patterned with “serpents and bosses” (shown above in the bottom section). The biblical scenes begin with Mary and the infant Jesus surrounded by angels in the center circle, then descending: Daniel in the lions’ den, Abraham preparing to sacrifice Isaac, King David playing the harp, and David defeating Goliath. The section above the center circle, and on the arms, have lions that symbolize Christ’s majesty. The serpents and bosses at the bottom (and on the opposite side) symbolize eternity and resurrection. The snakes often swallow their own tails, representing eternity. And since they shed their skin, that represented resurrection. The bosses (circular/cylindrical design accompanying the snakes) symbolize the wounds of Christ, appearing often in a group of five, for the nails in Christ’s feet (1), one in each hand (2 and 3), the spear in his side (4), and the crown of thorns piercing his brow (5). Slots on the short arms of the cross allowed for decorative mounts at various seasons of the church’s year. We gathered in the Abbey for evening prayer Friday night and morning prayer on Saturday with the modern-day Iona Community. The services were well done, particularly this morning for me. They were, in many ways, simple and ordinary: song and scripture and prayers of gathering, confession, intercession, sending. But ordinary faithfulness is the thing that is extraordinary. In this sense, what it takes to be extraordinary is not giftedness but consistency, not talent but time. St. Martin’s Cross is extraordinary in craftsmanship. Cut from a single stone, it is adorned with Scripture in images and Theology in patterned design. Yet its continued witness to Christ is due to standing up over a long time in the face of weather that would bring it down. Might we find a metaphor for Christian discipleship here? May our lives be extraordinary, not because of a brilliant moment or two or three, but rather due to our ordinary Christian faithfulness over time. Grace us, Holy Spirit, for such a witness as this.